If you have a theory or suggestion, I would be interested to hear it. Anyone who reads our blog is probably is aware that Baby Bop (our son) has some unusual neurological processing issues. Reading is particularly difficult for him. He can memorize words, but he just can't decode the sounds that the letters make. He has been in speech therapy since he was 18 months old. (He is almost 8 years old now). Recently, he has hit a new developmental window and is beginning to be able to decode letters and sounds (sound out simple words). But, this bring with it an interesting side effect from this letter sound decoding: he begins to yawn almost nonstop. It is an involuntary response. He is not even aware he is doing it unless I point it out. When he is looking at site words or word that he has memorized, he doesn't yawn. As soon as he starts sounding out an unfamiliar word, he yawns. I'm not talking about small yawns either. They are big, nonstop yawns. Today, we worked on reading. I had Baby Bop do a cartwheel or jump up and down every time he started to yawn. This would only bring a momentary pause to the yawning. As soon as he started sounding out a word, the yawns would start again. Really, the only thing that stopped the yawning was Baby Bop jumping up and down while he was sounding out the words (which he was more than happy to do). For now, I guess he is going to be jumping up and down while reading until we can come up with a better plan. I've asked my younger two daughters to watch this. I've been distracted and not kept up the archive for the Carnival of Homeschooling posted in the past. Please remember to send in a post about homeschooling for the next Carnival of Homeschooling, which will be held at Dewey's Treehouse. This will be the 444rd edition of the Carnival of Homeschooling. I do think our body language can influence how we think and act. It clearly isn't the only factor, but it is probably 5% what impacts us. The latest Charlotte Mason Blog Carnival is up at A peaceful day. Scientific American shares A Learning Secret: Don’t Take Notes with a Laptop. I find this interesting as my second daughter will be heading off to college this fall. “More is better.” From the number of gigs in a cellular data plan to the horsepower in a pickup truck, this mantra is ubiquitous in American culture. When it comes to college students, the belief that more is better may underlie their widely-held view that laptops in the classroom enhance their academic performance. Laptops do in fact allow students to do more, like engage in online activities and demonstrations, collaborate more easily on papers and projects, access information from the internet, and take more notes. Indeed, because students can type significantly faster than they can write, those who use laptops in the classroom tend to take more notes than those who write out their notes by hand. Moreover, when students take notes using laptops they tend to take notes verbatim, writing down every last word uttered by their professor. The study found that when taking notes by hand the student processed the information more deeply. And a big negative of those who had laptops was too many got distracted and used their computer for activities not related to their classes. My first impression of homeschooling was 25 years ago of a relative’s daughter. I thought she was kind of weird. She seemed very socially awkward and overly dependent on her parents for her age. So when my brother started a family 20 years ago and talked about homeschooling, I thought to myself 'uh-oh'. But as I have watched over the years, my opinion of homeschool has done a complete turnaround. My brothers kids are smart, independent and socially okay... well better than okay, they are unusually great kids. Sure I am kind of a biased Aunt but I have been very impressed. Henry's family is involved in a couple home school co-ops so the kids seem to get plenty of interaction with other kids but with a lot more adult involvement. Through the co-ops, the kids are involved in band, plays and choir. I have attended several performances and have been impressed by the quality of the other kids in the co-op. The smaller group size seems to provide both more options for growing talents and less possibility of getting lost in the shuffle that can happen fairly easily at a public school. I guess it is yet to be seen what kind of adults these kids become but at this point they are smart, kind, resourceful and hardworking so I expect they will continue on that track. Please remember to send in a post about homeschooling for the next Carnival of Homeschooling, which will be held at SmallWorld. This will be the 443rd edition of the Carnival of Homeschooling. Constance is hosting this week's Carnival of Homeschooling at The Foodie Army Wife. 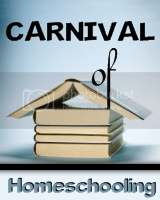 This week I am hosting the 442nd Carnival of Homeschooling! I know summer is in full swing, but I love to take a little bit of time to reorganize, declutter and tidy my school supplies and materials. Here’s an old picture of me from back in 2007. I came across this one the other day. One of my kiddos had snapped this of me while I was organizing the bookcases in the classroom. Go check out her picture and the carnival. I enjoyed Sunday's Soup Stone. Instapundit had a link to Girl, 10, not allowed to bring sunscreen on field trip due to ‘toxic’ nature. Sunscreen is one of the best protectors from the sun, but North East Independent School District parent Christy Riggs said her child wasn’t allowed to bring sunscreen to campus and suffered the burning consequences. Please remember to send in a post about homeschooling for the next Carnival of Homeschooling, which will be held at The Foodie Army Wife. This will be the 442nd edition of the Carnival of Homeschooling. Chareen is hosting this week's Carnival of Homeschooling at Every Bed of Roses. Welcome to the 441st edition of the Carnival of Homeschooling where home school families share their homeschool wisdom with us from all over the world via their blogs. We have now successfully completed 15 years of homeschooling. Here are a few things I have learned about education along the way that apply to homeschooling as well as any other educational option. 1) Children have their own time table for learning. When parents/teachers superimpose an arbitrarily determined schedule, it doesn’t work very well. Both the child and the parents/teachers get frustrated. Learning and the relationship suffer. [Yes, we had to learn this one the hard way]. 2) Children with parents who are involved and invest the time get a better education. Homeschooling parents have the advantage here because we have more power than the PTA president or a classroom volunteer. However, parents who are on the ball make a big difference. No program or policy can replace a good parent. 3) Successful educational programs address the needs of the whole child. A curriculum/program that produces high SAT scores and a child with an anxiety disorder and/or a weight problem is NOT a successful program. 4) Moral and character development are equal, if not more important, than academic learning. If a child leaves their k-12 education lacking a work ethic and integrity, than nothing else really matters. 5) Testing, if used properly, is a tool. We use standardize testing to find strengths and weakness in our efforts and to help plan future curriculum choices for that child. Because each child is an individual, what works well for one child may not work for another and testing tells us that. We don’t teach to the test. Teaching to the test defeats the purpose of the test. 6) Flexibility is king. Rigid curriculum/styles/programs don’t work well. If a child knows the material, don’t waste time on that lesson. Move on. If the child needs or wants more time to delve more deeply into the material, stop and take the time. This is one area where traditional classroom style education often falls short. Unless you are teaching a room full of clones, some child is going to lose out. There are some very talented teachers who do have the skill to meet most of the needs of a diverse classroom, but that is the exception not the rule. This is also why sorting children by age and not ability and interest falls short. 7) Free time matters. Children need free time to grow and learn how to govern themselves. 8) Children need adult supervision and interaction. As a parent, I am NOT raising children; I am raising an adult. I want my children to have successful adults meaningfully involved in their lives to act as role models. Your teenage needs just as much adult interaction as your toddler. 10. Educational goals should be unique to the child. Not every child is meant to be a software engineer or in an academic career. Do not ignore the value of practical skills or non-academic professions. College is not the only track to a successful life. Please remember to send in a post about homeschooling for the next Carnival of Homeschooling, which will be held at Every Bed of Roses. This will be the 441st edition of the Carnival of Homeschooling. Gary is hosting this week's Carnival of Homeschooling at HomeschoolBuzz.com. Homeschooling has it’s seasons. We all knew when we started this journey that the goal was to someday graduate. We just graduated our second son here at the Davis home. One more to go. Certainly we have mixed feelings as we see our sons become more independent but there’s joy in knowing we were there and part of their lives every step of the way. Our own Kathy tells the story as we Graduate Number Two at Homeschoolbuzz.com. One of my brothers lives in Anguila. Vince started homeschooling his older two boys a year ago. The boys are now 10 and 12. He and three of his boys are in town for a couple weeks. We are on our way to a family reunion. Yesterday as we traveled down the freeway I asked him about his experience with and thoughts on homeschooling. He said they are using K to 12. He says they are homeschoolers in the morning and unschoolers in the afternoon. He has told his boys that once they get their assignments done they can do pretty much whatever they want. Vince said sometimes they'll drag their feet and he won't get lunch together until they finish their assignments. We've arrived, so so I have time to add a few more details. Vince has his own business and is able to bring the older two boys with him when he goes to work. He is able to work with them a bit and provide help and encouragement. As we were driving down the freeway we got talking about how some parents get so focused on academics, both with public school and homeschooling, that the full character of the student gets ignored. We talked about some of the people we grew up with who did great in public schools and even in college, but floundered afterwards. Vince wants his sons to have a solid academic education. He wants to them know how to read, write, handle math, know history and so on, but it is more important to him that they learn initiative, how to work hard, to be honest and so on. "In a large family it is just not possible to spoil the kids." It is a bit of an exaggeration, but he did point out that with several children they all have to contribute some to the family, doing chores and so on, so it is much hard for children to think they are the center of the universe. One of the most important lessons we can teach our children is to pass the Marshmallow test. Media promoting self-esteem may be detrimental, experts say reaffirms this. "I think one of the main reasons why this cult of self-esteem has caught on is because there's a really fundamental belief in American culture that feeling self-confident helps you succeed," Twenge said. "I think that's why it's really spread so widely. The problem is, that basic belief isn't true. Self-control is much more linked to success than self-esteem." questions. He gave me complete and helpful answers. What's the difference between a taxidermist and a tax collector ? minutes later with the watch. The ambassador said, "Thank you very much," said the ambassador. "I hope that I didn't cause any crisis between you and them." accepted the fruit as payment, and lost $10,465 on the stereos. neck-and-neck? Well it is not true. the son of his father but a president is not. going to just sit around. understand how this works gets to be president. that the budget is more talkable than balanceable. and go while politics are with us all the time. a day until he finds out what he is supposed to do. although I have heard them called other things. who is the most elected. the convention and whelms the delegates. it is talking about an election. so you tear it up. they mean the one who can think of the most things to promise. out of ideas and keep shouting anyway. go on a whistle-stop tour without a train. California robber ran into his mother while making his getaway. to the ground and sat on him until authorities arrived. captured him at his house, where he showed them his "weapon." twenties." The robber took them and left. thinking it was a tollbooth, offered the security men money. still unconscious when the police arrived. 69 percent of the bank holdups reported.